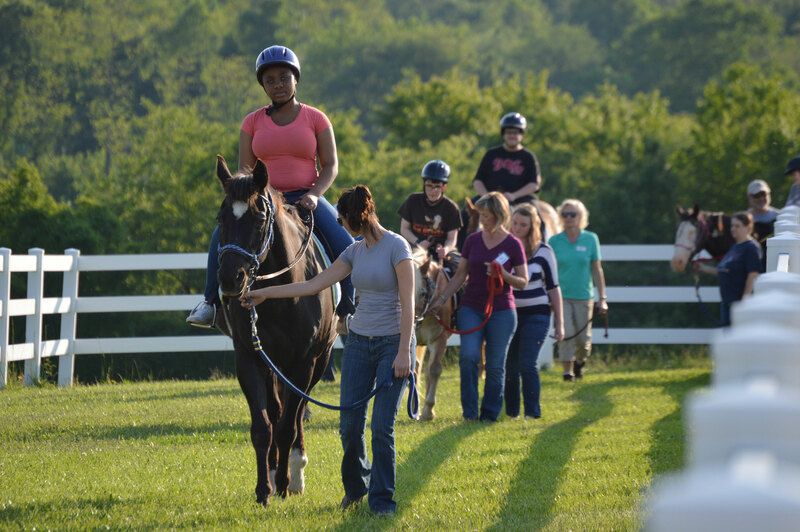 CTR is proud to be Harford County’s only year-round therapeutic riding facility. Unlike many other therapeutic riding centers, CTR offers horseback riding lessons exclusively to individuals facing physical, neurological, and psychological challenges. These include (but are not limited to) autism, Down Syndrome, cerebral palsy, attention deficit-hyperactivity disorder (ADHD), seizure disorders, Asperger’s syndrome, and amputees . Therapeutic riding is proven to benefit the emotional and physical well-being of our riders. They find acceptance and camaraderie in the barn, and parents of special needs children find new, supportive friends. CTR’s program focuses on learning riding skills and horse related responsibilities in order to expand upon the physical, mental and emotional benefit of the rider. The gait of the horse provides consistent movement to the rider, relaxing muscles and improving balance. The non-judgmental nature of horses allows the rider to learn to trust and form lasting friendships. Each therapeutic riding lesson is under the direction of and conducted by a registered therapeutic riding instructor. Unlike most therapies, therapeutic riding is FUN and it produces results! Low Impact Support Services (LISS) funding is accepted. If you are interested in riding lessons, please complete the Lesson Interest Form and CTR will contact you!